How do you get people interested in planning for their own death? It sounds like the ultimate marketing challenge. As Tom Farmer, the founder of KwikFit, the UK tyres-and-exhaust chain, once remarked, “Nobody wakes up in the morning and says ‘I wish I had a set of new tyres for the car’.” Very few of us really want to plan our own funeral. But that convention is changing. Driven, perhaps, by the decline of traditional churches and the growth of agnosticism, people are more open to the idea of planning their funerals, just as readily as they might prepare a will or bequeath personal items to loved ones. Funerals are becoming less religious and more like joyous celebrations of life. It’s not unusual to hear rock music at the end of a funeral ceremony these days. It is also becoming more common to find burials taking place in remote and beautiful parts of the country, with the deceased buried in environmentally-friendly cardboard or some other sustainable container. My fellow Scot, Barbara Chalmers, recently launched Final Fling as an online haven for those who want to influence what happens to them from beyond the grave. Final Fling has attracted a few thousand regular visitors, and 700 people have already used its service to store their wills and final instructions for what they want done in the event of their death. “I want Final Fling to be to death, what mums.net, a UK network for mothers, is to birth,” she remarks. Chalmers is a typical entrepreneur. She has worked – and continues to work – as a performer, media trainer, consultant, researcher and all-round action woman. Final Fling came about when she realised a lot of “baby boomers” are doing 21st century death, differently. Final Fling provides them with an online “safe deposit box.” Favourite photos and home movies can be stored alongside personal notes and mementos for children and other loved ones. “Think of it as a digital legacy,” explains Chalmers. How does she market? “Almost completely online, and very heavily using social media and SEO,” she adds. The accolades followed launch quite quickly. Final Fling was named Best New Website by Web User magazine soon after launch last year. Notably, Good Funeral Guide was praised for making the “Most Outstanding Contribution to the Understanding of Death in the Media” only weeks later. Chalmers is an astute PR operator who will leave no cliché unused in her pursuit of publicity and signed-up users. Longer term, she anticipates building revenue through advertising and sponsorship. Apart from her own UK operation based in Glasgow, she has licensed the online service to a South African operator. She claims a higher motive that simply making money. “We need to encourage people to plan for death. It makes life easier for their families in bereavement. The stigma of death is fading in these modern times, and it is easier to get people to talk about it,” believes Chalmers. Final Fling uses online media for promotion, but it also uses physical events, including a “Death Café” to bring people together to talk about the subject. It has used TED Talks videos to encourage people to think about things they want to do before they die. It runs workshops and similar events to discuss planning for death. It also provides advice on coping with loss. And, of course, its services include finding the best funeral director, flowers, music and all the paraphernalia of death. It all seems very Six Feet Under, and a long way from the cynical business exposed 50 years ago by journalist, Jessica Mitford, in The American Way of Death. In the UK, 500,000 people die every year. The funeral industry is worth around £2 billion a year. Chalmers wants to meet the boomers’ demands for eco-coffins, non-religious ceremonies, motorbike hearses, ashes that are made into fireworks and so on. It also demonstrates that the best business ideas are not necessarily all-digital. Chalmers has used the web cleverly, and continues to use the Final Fling website and its social media to good effect in promoting her business. The core of the business, however, is just as physical as it is digital. Beyond the website – and Chalmers’s personal time – it has an extraordinarily low overhead. Its location is less vital than it would have been in the past, and the franchising idea (begun in South Africa) offers real potential. 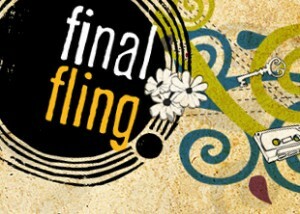 Ultimately, Final Fling is another online resource that adds a great deal of value at minimal cost. Maurice Smith is a journalist, consultant and entrepreneur based in Glasgow, Scotland. The one thing I am clear about is the importance of naming the thing. Dead. Death. Dying. I was looking at a report from a bereavement charity recently and managed to get through the dozens of pages without ever reading a single word about death. That’s the culture I’m tackling. Interested to know how it is across the pond.